The flowers for your wedding may be a tough decision, but when it comes to your bouquet, well, that seems to be even more difficult in most cases because of today’s multitude of offers. A crucial item for any bride, the bouquet has transcended the years and has become a fashion masterpiece in itself, like the dress, the rings or any other wedding accessory, with its own importance and moments throughout the event, to be found in various styles, colors, with ribbons, fabrics or even jewels. Your personal style: are you the traditional romantic type or more of a nontraditional modern bride? Are you ready to experiment or do you prefer the classic offers? Don’t try to be someone else just because you went to a wedding, and you saw a beautiful red roses bouquet that seemed just perfect for that bride. Sometimes, even the most beautiful things may lose their beauty when worn by someone who doesn’t have chemistry with that object. It’s not that you don’t have a style, it’s that you are merely different, and you have to adapt the bouquet to yourself. Your favorite flowers and the season: do you have any favorite flowers? Are they seasonal or will you find them throughout the whole year? Are they resistant or at risk to fade earlier than expected? It’s crucial to have beautiful flowers during the whole event, and that is a fact. Of course, any professional florist will help you fulfill this objective and give you free stress and free panic moments. 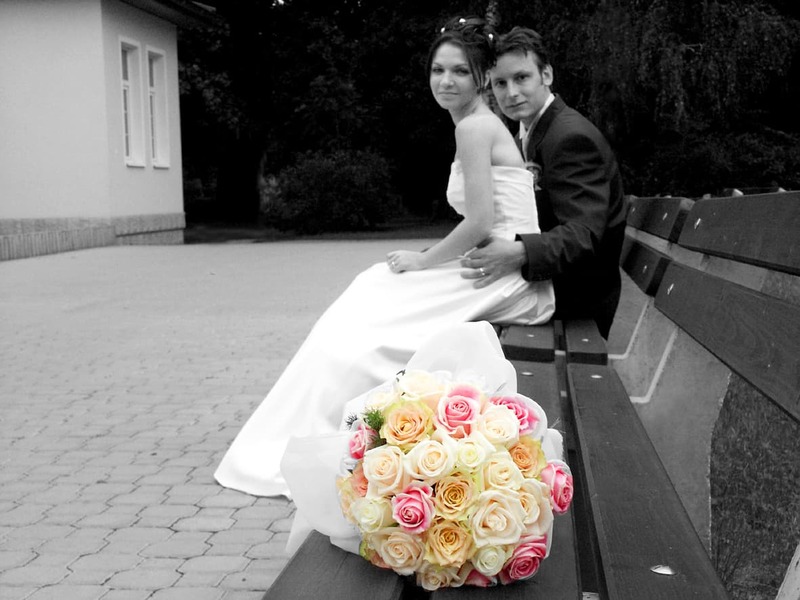 Remember that the bouquet is also one of the heroes in the photo shooting and it should remain fresh and impeccable. Your physical appearance: what’s your height? Are you tall or rather small? Do you have a fit silhouette or are you rather voluptuous? It’s imperative to choose the bouquet based on your appearance. A small person will look even smaller with a cascading bouquet and a little nosegay for a chubby lady will look nonexistent, will lose its beauty because of its dimensions compared to the bride. Keep the right balance. Your budget: do you love flowers? Are you ready to spend a significant amount of money for the bouquet or just keep a fair limit? Don’t forget that you also need bouquets for the bridesmaids, boutonnieres, and centerpieces for the tables. Not to mention you may put flowers on the chairs or a “flower spray” bouquet to décor the pillars inside the venue. A bridal bouquet ranges from $20 up to hundreds depending on the florist and the complexity of the model. An interesting idea might be to find a florist offering a package to cover all your needs and also offer you at least two samples: one for your bouquet and one table centerpiece. Now, we’ve made a little bit of research with our florist friends, and we came to a very interesting conclusion: the bouquet itself may come to life based on your style and preferences. For the mono color bouquet lovers, we believe green is the perfect choice. Green is an adamant color, showing self-confidence, friendship, and as any natural color, it goes perfectly with almost any wedding dress, be it white, beige, ivory… or even pink. It also gives a very stylish accent to the photos. Here are some photos you can have a look at for inspiration. No flowers for the bouquet! For those of you who prefer to stand out from the crowd, the trend is to choose the fabric bouquets, jewel bouquets or even feather bouquets. All these choices are being quite out of the box! Choosing fabric and jewel could be a very original statement; however you have to know it will put some limitations to your accessories and even to the dress. So, if you prefer the complexity of a jewel bouquet, then you should resist the temptation to accessorize the dress or wear sophisticated jewelry. The feather bouquet, on the other hand, is a powerful way to say “I know who I am”, but you need a very skillful designer because it can easily go from original and elegant to bad taste. The bouquet should not be large, and it should keep the natural colors of feathers. We do not recommend colored feathers. Keep it simple and natural! Here you can find some suggestions and interesting ideas! Expect the unexpected or having a bouquet that is not quite a bouquet. The purse of flowers is also an attractive option, especially for those of you preferring to wear a clutch. It practically combines the idea of purse and bouquet, but rather standing as a bouquet. A skillful florist is again a must have because the aspect of the purse is given by the smart arrangement of the leaves and flowers and the way they are tight to one another with pins and other accessories. The fan bouquet, which we find extremely attractive and original, can be of great elegance and style. We assure you it will put a charming accent on your dress. More ideas here! The succulent plants give the bouquet the right energy. These flowers, with their fleshy aspect, are very resistant so they can make a real great choice for your big day. We love their dusty look and the friendly colors, especially because of the various hues and tones. The classic color with accents gives you the possibility to stay traditional, but still have original and colorful notes. From our point of view, a white based bouquet will always attract a wide variety of accents. Basically, in bouquets, white can stand near any color, except pale ones, for example light pinks or yellows. A great combination is white with stylish green and red accents. Remember, for an elegant aspect, keep the white as the predominant color. Winter wedding? No problem. While you may face some difficulties in finding your favorite flowers in mid-December, designers have already found great ways to offer you a memorable day. As winter is the white season, we believe you should bring some color to it so we recommend you to avoid pale colors, such as light tones of blue, green or pink, and jump in for the powerful colors: full reds, greens, and brown or grey accents, for silky accents. A wedding bouquet may seem a simple choice, sometimes at the end of the priorities list, but as you can see, it is not as simple as that. Make a wise choice, consider your budget and your appearance, don’t let yourself influenced by other brides’ choices and prepare yourself for a beautiful life, with vivid colors and scents as the flowers in your bouquet.